DANIELE GATTI FOR THE WIN! Tomorrow night's Carnegie Hall Opening Night Gala with the Boston Symphony Orchestra will be conducted by that Milanese powerhouse Daniele Gatti. Gatti replaces James Levine, who yesterday announced his absence from all Fall performances to recover from looming back surgery on a herniated disc. Berlioz's Roman Carnival overture will be replaced by Beethoven's Coriolan overture. OC will be there tomorrow night in an Inter jersey, which she'll wear over her Miu Miu dress. OMG they shrunk the Maestro! WTF Carnegie? Look at the little baby piano I will play for yoooouuuuu! "At the age of 12 I moved to Paris to study harmony and counterpoint with Nadia Boulanger. When I arrived for my first lesson, The Well-Tempered Clavier was on the music stand of the grand piano. She turned the pages forward and back; finally she settled on the Prelude in E minor from Book One and said: 'Right, my boy, now play it for me in A minor.' She held a wooden ruler in her hand and every time my fingers played a wrong note she tapped them with it. Thus, The Well-Tempered Clavier became the foundation for everything." 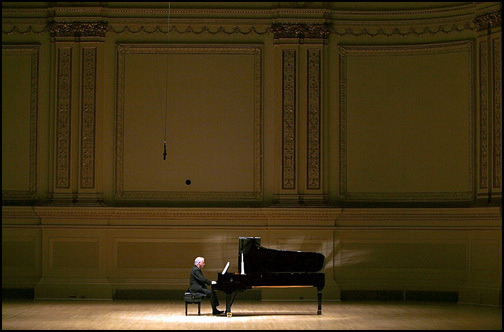 Happy 50th anniversary at Carnegie Hall, Maestro; may you play and conduct for 50 more. 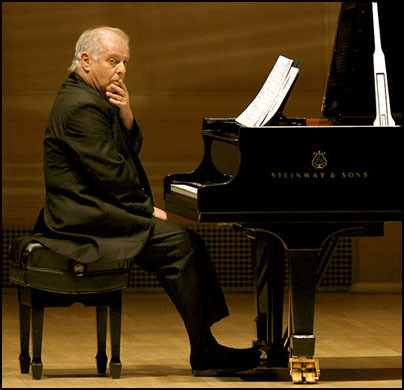 The Opera Chic "Barenboim Plays Carnegie" Flickr set is here.